This Privacy Notice (“Notice“) describes how 3V Benelux B.V. (“3V“), Wirecard UK & Ireland Limited (“WUKI“) and Wirecard Card Solutions Limited (“WDCS“) (WUKI and WDCS, together “Wirecard”) collect, store and use your personal information (“Personal Information“) in connection with: administration of the pay2d programme and your pay2d card and account (together the ” pay2d Programme“); and, your interactions with the www.pay2d.nl site (the “site“). In this Notice, we use the terms “we“, “us“, and “our” (and other similar terms) to refer to 3V and Wirecard, and “you” and “your” (and other similar terms) to refer to our cardholder customers, contacts, suppliers, job applicants and site visitors. This Notice is an important document. We recommend that you read it carefully and print and keep a copy for your future reference. What does 3V and Wirecard do? 3V is a provider of pre-paid products. 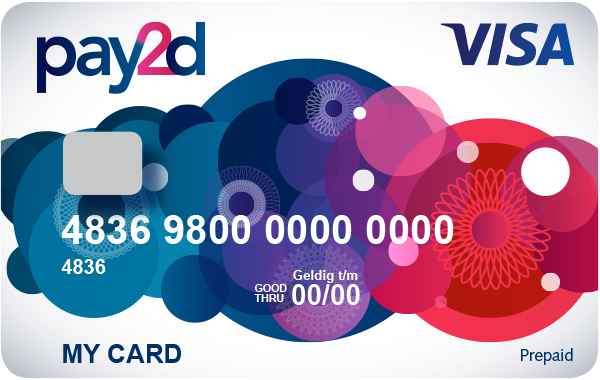 3V works with Wirecard to distribute and operate the pay2d Programme. 3V is responsible for the general distribution of the pay2d Programme, marketing of the pay2d Programme and acts as the initial point of contact for all customer services queries and complaints related to the pay2d Programme. For data protection purposes 3V is a data controller of the Personal Information it processes in connection with the pay2d Programme. Wirecard is responsible for the overall administration of the pay2d Programme, (including regulatory authorisations) but works with 3V to operate and issue the pay2d Programme. Wirecard UK & Ireland Limited (“WUKI“) operates the pay2d Programme site available at www.pay2d.nl (the “Site“) and acts as the “programme manager” of the pay2d Programme, managing registration of cardholders, arranging for provision of the cards and e-money and generally administering the pay2d Programme. WUKI works with Wirecard Card Solutions Limited (or “WDCS“) who provide all necessary regulatory authorisations, card issuing and settlement services in connection with the provision of the pay2d Programme. For data protection purposes both WUKI and WDCS are each data controllers of the Personal Information each processes in connection with the provision of their respective services under the pay2d Programme. If you are a pay2d Programme customer: We will collect and use name, address, DOB, email address, mobile number, IP address of sign up location, bank account details, and any and all other supporting ID documents that may be required (i.e. including utility bills) and that you provide in connection with your pay2d Programme application. If you are a site visitor: We will collect any information that you provide by filling in forms on its site. This might include information provided at the time of registering to use the site, subscribing to the pay2d newsletter, applying for the pay2d Programme, posting material or requesting further services. We may also ask you for information when you report a problem with the site. If you write to or otherwise correspond with either 3V and/or Wirecard: each will keep a record of that correspondence and may share with the other party to the extent necessary in connection with the pay2d Programme. If you complete any online surveys: we will use your responses for research purposes. If you are a pay2d Programme customer: in operating the pay2d Programme, Wirecard will automatically collect information about the transactions that you make using your card, your card number, customer name, transaction amount transaction date, merchant name and any details about applicable chargebacks in connection with its provision of card issuing and settlement services and for the purposes of the prevention and detection of fraud and to comply with its legal obligations including those relating to anti-money laundering and FCA obligations. If you are a seek customer service support: We may keep a record of the correspondence including for the purposes of quality assurance and training. If you are a site visitor: Wirecard will automatically collect, store and use certain, limited information relating to your use of the site for the purposes of better understanding the types of visitors who browse the site and for improving the site offering. Specifically, the information Wirecard will automatically collect will include information like your IP address, device type, unique device identification numbers, browser-type, broad geographic location (e.g. country or city-level location) and other technical information. Wirecard will also collect information about how your device has interacted with the site, including the pages accessed and links clicked. Collecting this information enables Wirecard to better understand the visitors who come to the site, where they come from, and what content on the site is of interest to them. We use this information for internal analytics purposes and to improve the quality and relevance of the site to its visitors. Some of this information may be collected using cookies and similar tracking technology, as explained further under the heading “Cookies and similar tracking technology” below. If you are a pay2d Programme customer: we may also receive information from you via third party fraud prevention and credit reference agencies or other organisations as necessary in connection with each party fulfilling their legal obligations, including anti-money laundering and FCA obligations in connection with the pay2d Programme. For customer due diligence and fraud prevention purposes. We will use your information for the purposes of carrying out customer due diligence, money laundering and fraud prevention checks to ensure that we are complying with our regulatory obligations. To provide the pay2d Programme services: We will use your information to administer the pay2d Programme, for example, arranging the provision of your pay2d card, loading your card, settling payments and managing chargebacks, facilitating settlement and reconciliation of your account, carrying out routing transaction monitoring for compliance with FCA obligations and VISA and MasterCard scheme requirements, communicating with you in relation to your pay2d card and account, dealing your customer enquiries or complaints, and collecting any applicable charges or costs in connection with the pay2d Programme. For training, monitoring and quality assurance purposes: We may monitor telephone and e-mail communications between us for the purpose of quality assurance and training or as otherwise permitted by law. For communication purposes: We will use information contained in any correspondence for the purposes of communicating with you in connection with the pay2d Programme or your account, or in response to your contacting us. For marketing purposes: We may use your information for the purposes of telling you about other products and/or services that might be of interest to you, where we have the necessary right to do so. For site analytics purposes: We may use certain information relating to your use of the site for the purposes of better understanding the types of visitors to the site and improving the site security and offering and for general analytics purposes. If you wish, to access, correct, update or request deletion of your Personal Information, you can do so at any time by contacting us using the contact details provided under the “How to contact us” heading above. In addition, you can object to processing of your Personal Information, ask us to restrict processing of your Personal Information or request portability of your Personal Information. Again, you can exercise these rights by contacting us using the contact details provided under the “How to contact us” heading above. You have the right to opt-out of marketing communications we send you at any time. You can exercise this right by clicking on the “unsubscribe” or “opt-out” link in the marketing e-mails we send you. To opt-out of other forms of marketing (such as postal marketing or telemarketing), then please contact us using the contact details provided under the “How to contact us” heading above. Similarly, if we have collected and process your Personal Information with your consent, then you can withdraw your consent at any time. Withdrawing your consent will not affect the lawfulness of any processing we conducted prior to your withdrawal, nor will it affect processing of your Personal Information conducted in reliance on lawful processing grounds other than consent. Again, you can exercise these rights by contacting us using the contact details provided under the “How to contact us” heading above. Group companies, service providers and other affiliated third parties: who provide data processing services to 3V Benelux BV in connection with its provision of pay2d Programme services, or who otherwise process Personal Information for purposes that are described in this Notice or notified to you when we collect your Personal Information. To any competent law enforcement body, regulatory, government agency, court or other third party: where we believe disclosure is necessary (i) as a matter of applicable law or regulation, (ii) to exercise, establish or defend our legal rights, or (iii) to protect your vital interests or those of any other person. To an actual or potential buyer: (and its agents and advisers) in connection with any actual or proposed purchase, merger or acquisition of any part of our business, provided that we inform the buyer it must use your Personal Information only for the purposes disclosed in Privacy Notice. Group companies, service providers and other affiliated third parties: who provide data processing services to Wirecard in connection with its provision of pay2d Programme services (for example, to support Wirecard’ due diligence services or hosting), or who otherwise process Personal Information for purposes that are described in this Notice or notified to you when we collect your Personal Information. However, we will normally collect Personal Information from you only (i) where the processing is in our legitimate interests and not overridden by your rights, (ii) where processing is necessary to fulfil our pay2d Programme contract with you; or (iii) we have your consent to do so. In some cases, we may also have a legal obligation to collect Personal Information from you or may otherwise need the Personal Information to protect your vital interests or those of another person (e.g. our legal obligation to carry out appropriate customer due diligence and anti-money laundering checks). If we collect and use your Personal Information in reliance on our legitimate interests (or those of any third party), this interest will normally be to provide our services to you and for our legitimate commercial interest, for instance, when responding to your queries, improving our platform, undertaking marketing, or for the purposes of detecting or preventing illegal activities. We may have other legitimate interests and if appropriate we will make clear to you at the relevant time what those legitimate interests are. If you have questions about or need further information concerning the legal basis on which we collect and use your Personal Information, please contact us using the contact details provided under the “How to contact us” heading above. 3V does not transfer Personal Information to any third party located outside of the European Economic Area (or “EEA“). Wirecard may need to transfer your Personal Information to business partners, service providers and other Wirecard offices that are located in territories outside of EEA. For example, as well as described above in respect of Wirecard offices in Germany, we may provide customers’ prepaid card and associated accounts and services from centres such as the USA, Dubai and India and we may process payments through other organisations such as banks, payment processors, card networks and payment schemes. Personal Information transferred out of the EEA are safeguarded under the terms of the European Commission’s Standard Contractual Clauses. Please note that the legal regimes of some territories outside of the EEA do not always offer the same standard of data protection as those inside the EEA, although we will ensure that your Personal Information is only ever treated in accordance with this Notice and, if you are a customer, our terms and conditions. We have in place what we believe to be appropriate technical and organisational security measures to protect your Personal Information against unauthorised or unlawful use, and against accidental loss, damage or destruction. We put in place strict confidentiality agreements (including appropriate data protection obligations) with our third party service providers. The measures we use are designed to provide a level of security appropriate to the risk of processing your Personal Information. If you or others on your behalf give us any Personal Information about another person, you take full responsibility for complying with any relevant data protection laws which apply to the provision of that information to us, and our use of it as explained in this Notice. We retain Personal Information where we have an ongoing legitimate business need to do so (for example, to provide you with a service you have requested or to comply with applicable legal, tax or accounting requirements). We may update this Notice from time to time in response to changing legal, technical or business developments. When we update our Notice, we will take appropriate measures to inform you, consistent with the significance of the changes we make. We will obtain your consent to any material Notice changes if and where this is required by applicable data protection laws. You can see when this Notice was last updated by checking the “last updated” date displayed at the top of this Notice.